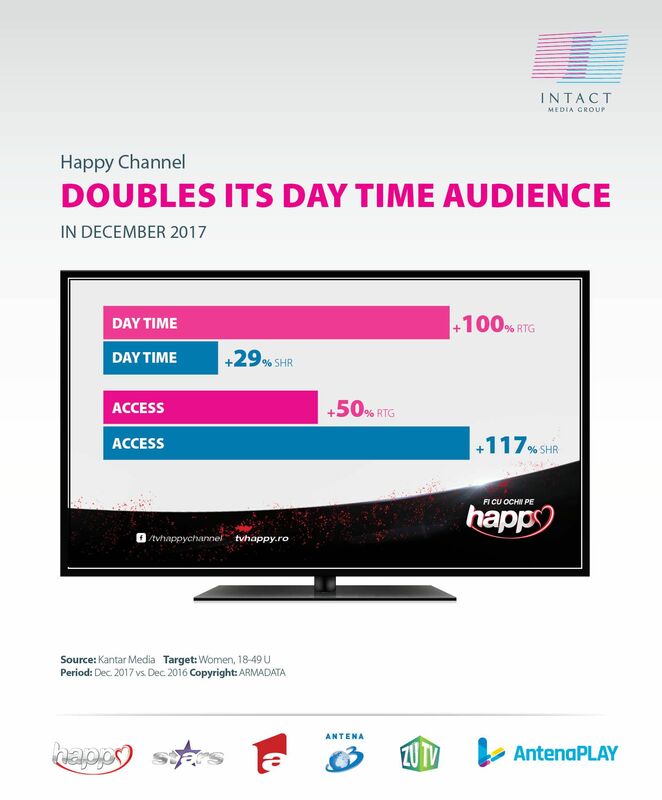 In 2017, Intact Media Group’s TV division consolidated its audience figures for strategic productions and time slots. Market share- wise, Intact’s channels held the leading position during Day Time, Access and Late Fringe on the urban target and during Day Time and Access on the national target. Antena 1, the flagship entertainment channel, home to the largest star system in Romania, consolidated its long term productions (Game of Chefs, IUmor, XFactor), while investing in content by acquiring new international star formats: The Wall, Asia Express, Guess my age. In this regard, the two seasons of Game of Chefs aired throughout 2017 reached a leadership percentage of 83%, while the two seasons of “IUmor” had a percentage of 63% leadership. 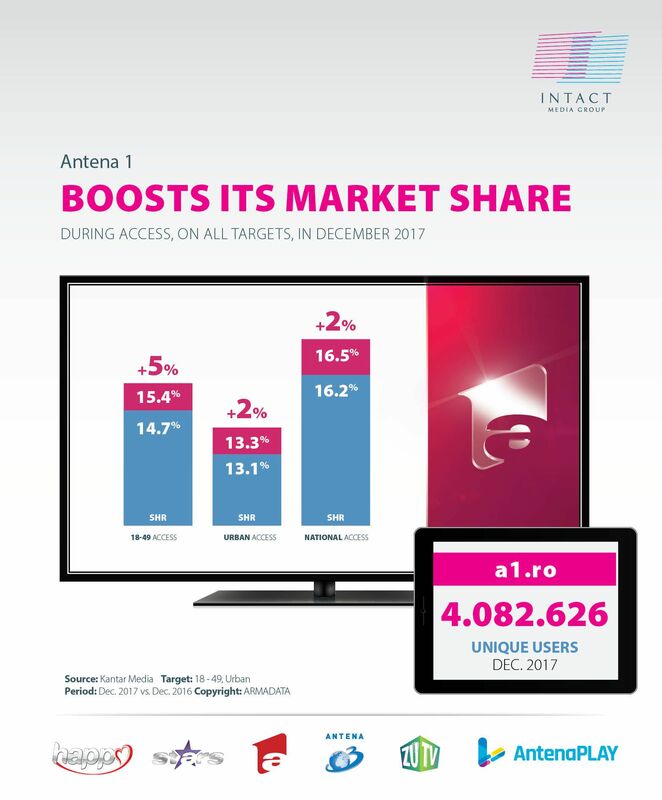 During the last month of the year, Antena 1 appreciated its market share during Access by 5% on the commercial target, respectively by 2% on both urban and national targets. The New Year’s Eve specia program, presented by Dan Negru, led the market in terms of audiences, for the 18th consecutive year. On the commercial target, the program scored 9.1% rating and 26.1 share. Antena 1 was watched in 2017, during Whole Day, for at least one minute, by 7.364.000 Romanians, whilst www.A1.ro had over 4 million unique users. 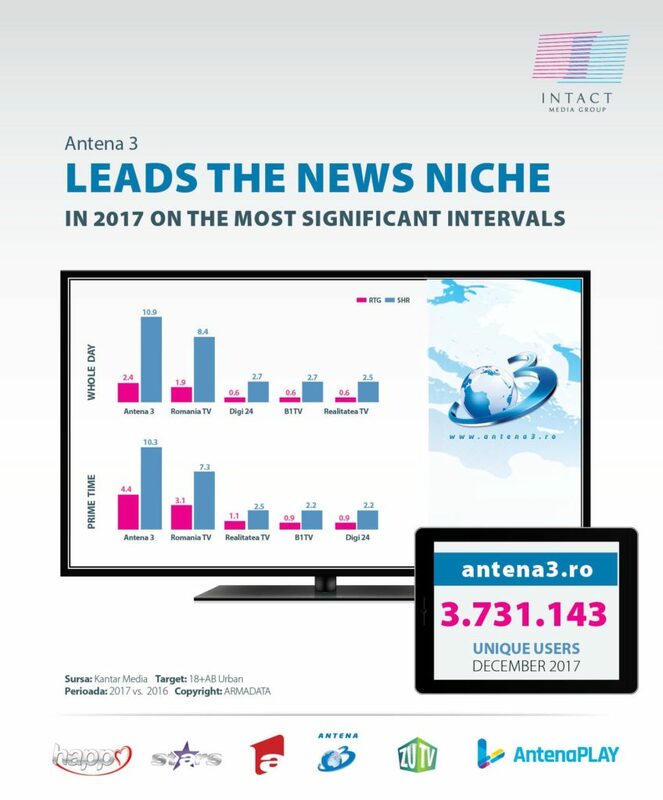 Antena 3 leads the Romanian news niche in 2017 on most time slots, amongst which Whole Day and Prime Time. On the national level, Antena 3 was watched last year by more than 3.9 million people every day. The news channel asserted itself as frontrunner of its category during primetime, on 18+Urban, All Urban and 25-54 Urban targets. At the same time, Antena 3 led the audiences during the whole day and primetime on the 18+AB target. During the week ( Mo-Fri), the news channel scored leadership over the 18+Urband and All Urban targets. 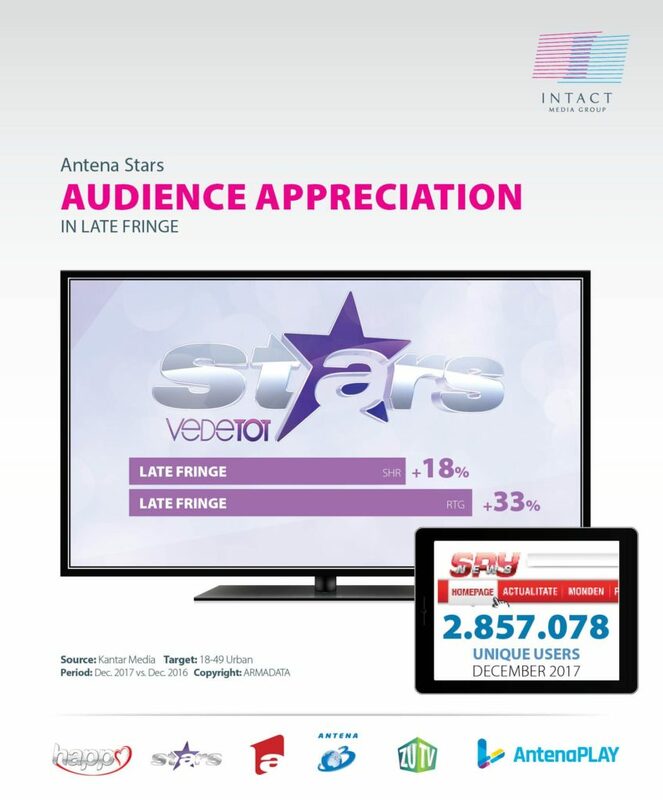 Antena Stars, the only TV channel dedicated to showbiz, was watched during 2017 by almost 3 million people, on the national target, during Whole Day, for at least one minute. The station appreciated both its audience and market share during Late Fringe by 33%, respectively 18% on the 18-49 target. December marked an evolution in market share by 7% during morning. The most popular productions of the month included Vedetelionul, Vedetop, Refresh by Oana Turcu, Răi da’ buni and Dosarele VIP. Happy Channel, the Group’s TV station addressed to women, was watched in 2017 by over one million viewers , on the national target, during Whole Day, for at least a minute. The audience spiked in December by 100% over Day Time and 50% during Access. The market share rose by 10% during Whole Day, 29% during Day Time and 117% during Access, compared to the last month of 2016. The most watched programs of the station in December were Intrusul (Insider), Elif, Mom, North and South, Happy Night. ZU TV, the channel that addresses the young generation (15 – 34 years old, urban population) became an interactive television in 2017. ZU put together social networking and a music station and presented the bot BreaZU, whom people can interact with in real time. By voting a favorite song, the public reactions’ can be seen on TV as six emoticons reinvented in the ZU Style. The most popular shows in December were: MieZU, Marea Unire ZU Most Wanted, Miezu’ and Orașul faptelor bune. 2017 was an excellent year for Digital Antena Group as well, as one of the most important online publishers in Romania and number one in online entertainment. Digital Antena Group holds in its portfolio six websites (amongst which a1.ro, spynews.ro and observator.tv), 30 Facebook pages used as awareness tools for Antena Groups’ productions (including Antena1, Acces Direct, In Puii Mei), over ten youtube channels with over two million subscribers, six mobile applications with hundreds of thousands of downloads and the SVOD Antena Play, with over 1,3 million accounts created. Moreover, Digital Antena Grop launched in 2017 the Data Management Audience department, dedicated to a good knowledge of the users with a view to optimize to the maximum the ad partners’ campaigns. In 2017, over 9 million Romanians watched Intact’s productions during Whole Day, for at least one minute, on national level, while 6.592.000 were reached during Prime Time. Intact Media Group thanks its public and partners for all their support and loyalty. Intact offers the ultimate content mix through its multichannel platform, for all age segments and consumer preferences.